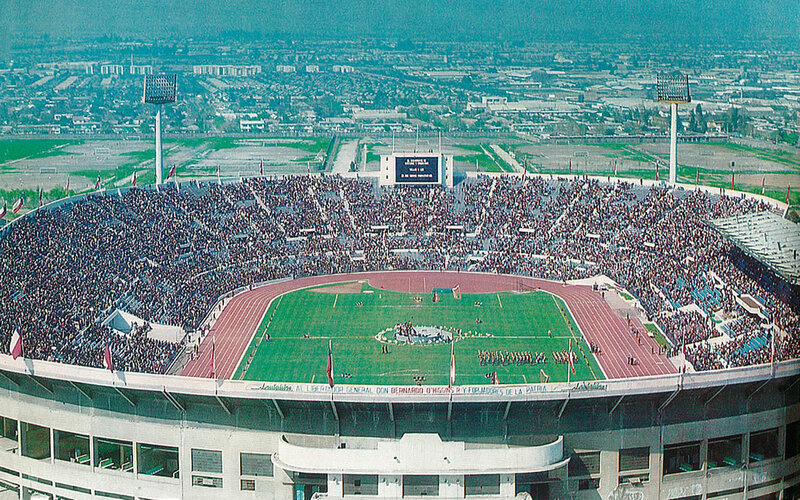 On 29 September 1979 Santiago’s National Stadium was filled with people from all over the city. 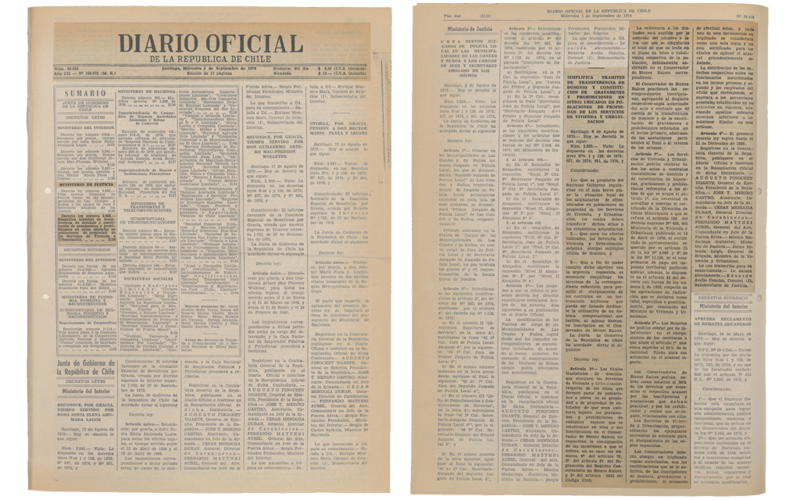 The focus of this gathering was not a sporting contest nor a concert but a massive bureaucratic operation in which 37,000 property titles to pobladores were processed in a single day in an attempt to resolve decades of makeshift land occupation and policies. 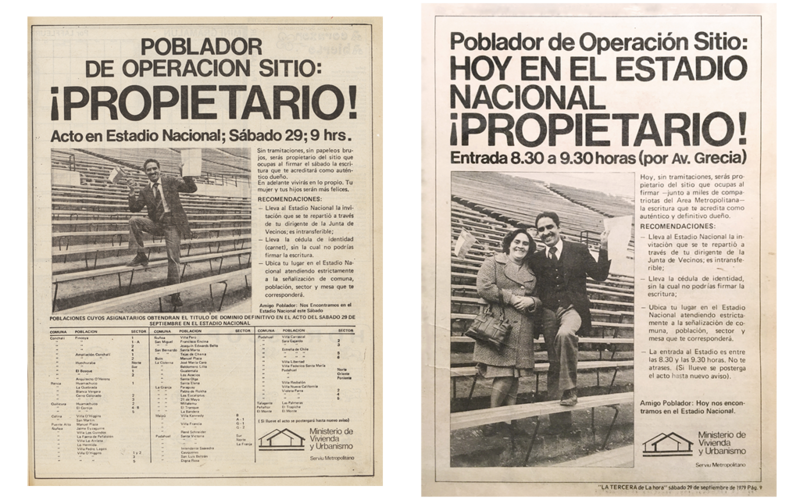 The audience were mostly beneficiaries of Operación Sitio (Operation Site), a 1960s national self-help housing initiative that responded to Chile’s severe housing crisis by giving people access not just to urban land but to a private plot within the city. To its critics, it was referred to as Operación Tiza (Operation Chalk), since the chalk tracing of a semi-urbanised 9 x 18 metre plot was what most people received—in other words, bare earth. To be able to call a piece of the city their own, however distant from its centre, beneficiaries then had to demonstrate financial savings over several instalments before they would be advanced onto another list, this time not of a piece of land (since they were already occupying it) but a piece of paper with their property title inscribed upon it. National Stadium, 29 September 1979. The booklet was a summoning tool, primarily consisting of a sixty-page list with the names of summoned people in alphabetical order. Lists of names have been a strong symbolic element included in the mechanisms of the biopower of states. The growing inclusion of man's natural life in the mechanisms and calculations of power comes to be what is at stake in politics. 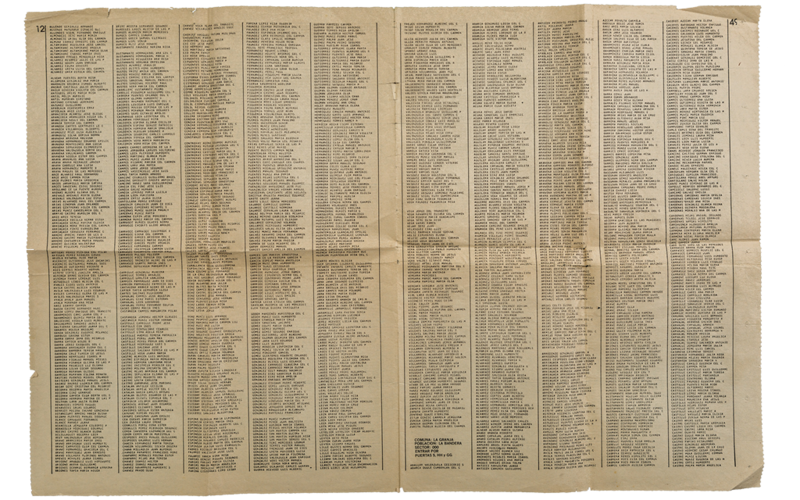 Lists of missing people, telephone guides, lists of war victims, lists of access to health programmes, detention lists, etc. are part of the imagery of inventories of modernity. The administration of life becomes apparent in this endless list of names of dwellers in an invisibilised city. 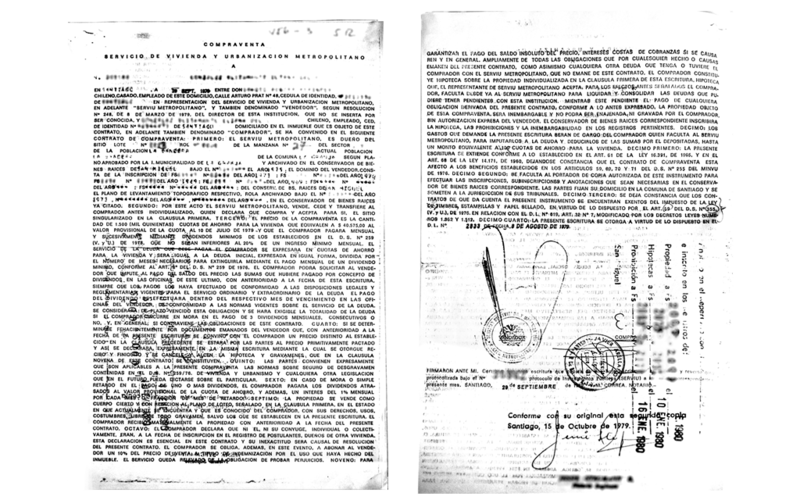 Official publishing of the Decree no. 2,833 of 8 August from the same yearthat "simplifies procedures of domain transference and encumbrances." In 1973 the constitution of 1925 is suspended, congress dissolved, and the state restructured according to a series of Law-Decrees (first in the form of official bans) focused, on the one hand, on promoting authoritarianism by the executive power and, on the other, on freeing the economy. One of the fundamental measures to accomplish this transformation was the restructuring of the city by Decrees such as no. 2,833, which simplified and accelerated the process of property transference from state agencies to private individuals. The Chilean case has the peculiarity that market liberations were established through an authoritarian government (strong executive power and an alienated judicial power) and not through democratic channels, clearing the way for the access of liberalism. A firmly built single-family house with wooden blinds lies on a meadow with large trees in an almost rural environment. A neat, landscaped plot surrounds the house—a garden of shrubs and flowers. A stoned entryway paves the way to the built dream of a house of one's own. 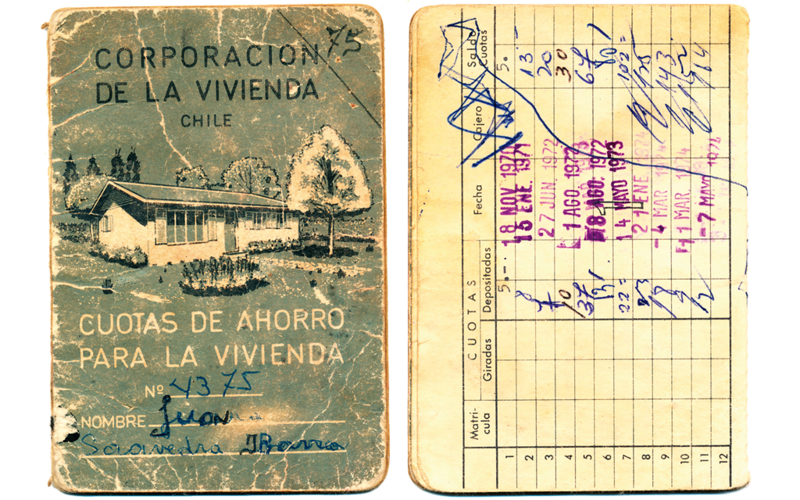 Besides a number and a name, these are the elements on the cover of the Savings Book distributed by the Housing Corporation and Chile's State Bank, as stated on the back cover next to the National Emblem. To be able to call a piece of the city their own, beneficiaries had to demonstrate savings of several instalments prior to being added to the list of those receiving their property titles. These were certified through a "Savings Book" identified with a number and the name of the dweller, and the location of their plot. Along with the name of the shantytown, other numbers were registered: that of the block and that of the plot itself. 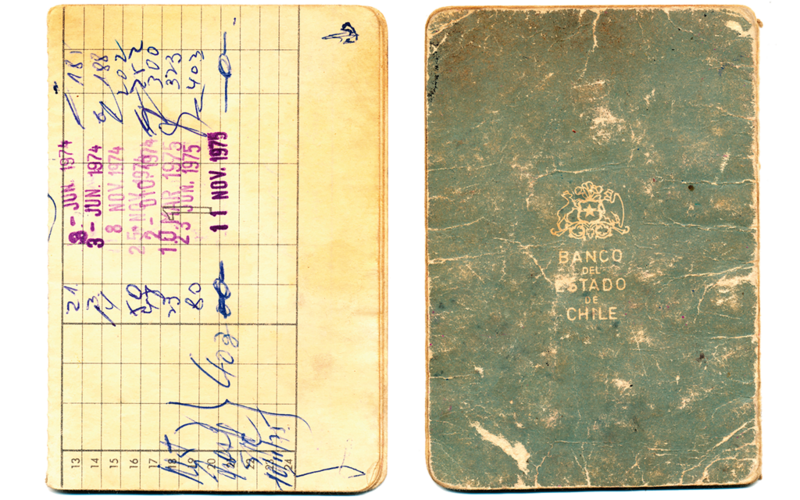 In the Savings Book, every paid instalment was registered with a stamp or signature, every line filled a step along the way to ownership. 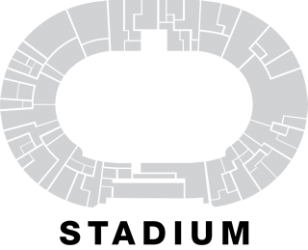 The property title was not only a legal and symbolic document, but an instrument of debt with specific spatial coordinates. What was given that day at the Stadium was not a housing solution, but a piece of paper regularizing the piece of land dwellers were already occupying. The approximate value of each instalment to be paid was $700 monthly for an extension of 5 years, and the price was exactly the same for every plot regardless of location or urban development. If three or more instalments were missing, consecutively or not, the administration could requisition from the dweller the amount of the entire debt. A new tabula rasa for the neoliberal city was reified in 37,000 individual contracts. 'PROPIETOR!' is the largest printed word in the event's advertisements. The emphasis on private property as a source of happiness was part of the installation of a set of aspirations and ideologies. These two advertisements and invitations to the event account for the role of the printed press in the construction of an image: 'From now on, you'll live on your own property. Your wife and your kids will be happier'.... 'Without bureaucracy, without 'witch'-paperwork you'll be the owner of the site you occupy'. The press played a significant role; the operative—which had shortcomings and generated disapproval— was positively portrayed to a wide audience, becoming a useful political mechanism that paved the way to numerous actions derived from this first grand operation across the country. Weeks before the event the Ministry of Housing published a booklet in the official press along with a blueprint plan of the stadium. 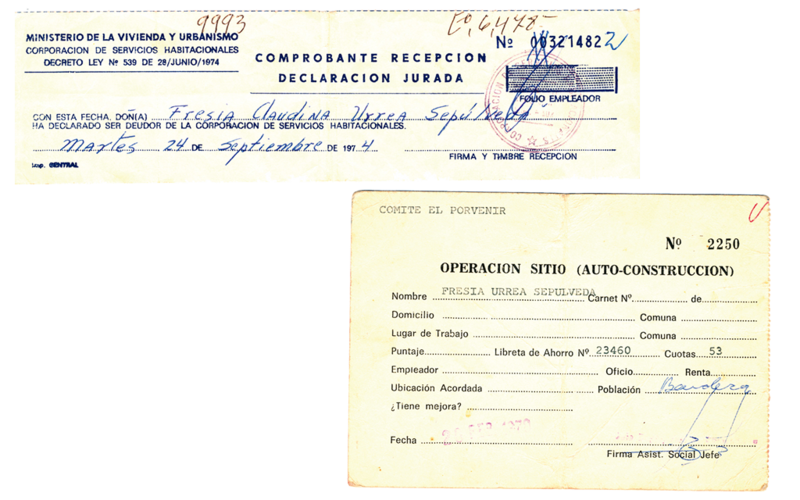 Sixty pages contained a long list of summoned people divided into the 17 communes of Greater Santiago, and in which more than 60 assorted slums were represented through various shantytowns and neighbourhoods. Each commune was then assigned a specific sector within the stadium (eg, 1, 2, 4-B, 1ª, etc), and a precise access door in the stand (eg, SS, RR, Q, J, HH, etc) which in effect created a complete grammar and aesthetic code connecting the building with the surrounding city.